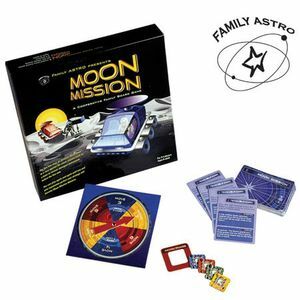 Learn about conditions on the Moon and teach your children teamwork with this cooperative family board game from Family ASTRO, our national program for family activities at the ASP. Race against time in an effort to retrieve damaged instruments scattered across the lunar landscape. Players must work together to accomplish their mission and get everyone safely back to Grimaldi Moon Base before the long lunar night falls (day and night on the Moon each last about 15 Earth days). Success depends on players developing a joint strategy, understanding conditions on the Moon, and a bit of luck. Developed by astronomy educators, the playing board is a photomap of the Moon's surface and the cards help acquaint players with what it's like on our neighbor world. For 2-4 players. Ages 8 to adult. For even more fun, take part in a Family ASTRO event. Visit the Family ASTRO web site to see if there is an official location near you.